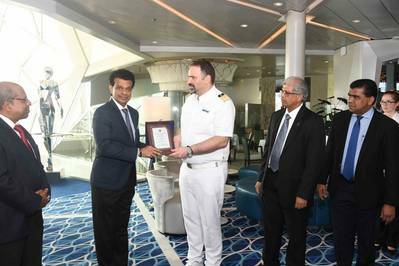 The super luxury passenger vessel MV Mein Schif 3 of TUI Cruises with 2,430 passengers and 995 crew on board made her maiden call at the Port of Colombo on 26th November 2018. The vessel was welcomed at the East Container Terminal (ECT) of Sri Lank Ports Authority (SLPA). Chairman of Sri Lanka Ports Authority (SLPA) – Dr.Parakrama Dissanayake said that the Port of Colombo was honored by the presence of Mein Shiff 3 in Colombo. “The Port of Colombo has become an extremely busy port and this year the port also became the fastest growing port in the world in terms of handling containers. The next area we are focusing is the passenger vessels and we have plans to construct a state of the art passenger terminal at the Port of Colombo,” he said. TUI Cruises is a Germany-based, joint venture cruise line of the German Tourist firm, TUI AG and the American cruise line operator, Royal Caribbean Cruises Ltd.. The company commenced operations in 2009 targeting German clientele, as an alternative to AIDA Cruises and Hapag-Lloyd cruises. Mein Schiff 3 is approximately 295 meters long and approximately 36 meters (118 ft) wide. The ship has 1250 staterooms, most of which have balconies, with a capacity of 2,500 passengers and a crew of 1,000. The ship includes several restaurants, a theatre, spa and nightclub. TUI Group has announced that as part of their modernization strategy, Mein Schiff 1 and Mein Schiff 2 would be transferred to Thomson Cruises over the next few years, as a result, 2 replacement ships Mein Schiff 1 and Mein Schiff 2 were ordered. This year on January 15, Mein Schiff 5 was launched and subsequently on April 28, Mein Schiff 6 was laid down. This ship, Mein Schiff 3 has commenced its voyage from Europe during the month of May. She has touched many ports in Europe over the last couple of months and thereafter cruises towards south Asia thru the Suez canal touching some ports in the UAE. The vessel that cruises under the flag of Malta called Colombo from Mumbai, India and her next Phuket, Thailand is her next port of call.